Lasting Perfection & M.A.C Studio Sculpt. This is still quite a new purchase for me. I’ve only had the above two items for a week although I am so in love! I’ll start by writing about the collection 2000 lasting perfection concealer (I know it is now just collection, but I can’t get used to that so you’re gonna have to put up with me sounding dated, sorry). This is such a hyped product on the bloggersphere and on youtube and yet it took me so long to get my paws on it. This is partly down to me trying to me good and to finish up products I already had but I just wasn’t getting on with my Boujoir Healthy Mix one, so goodbye to that, and hello Lasting Perfection! 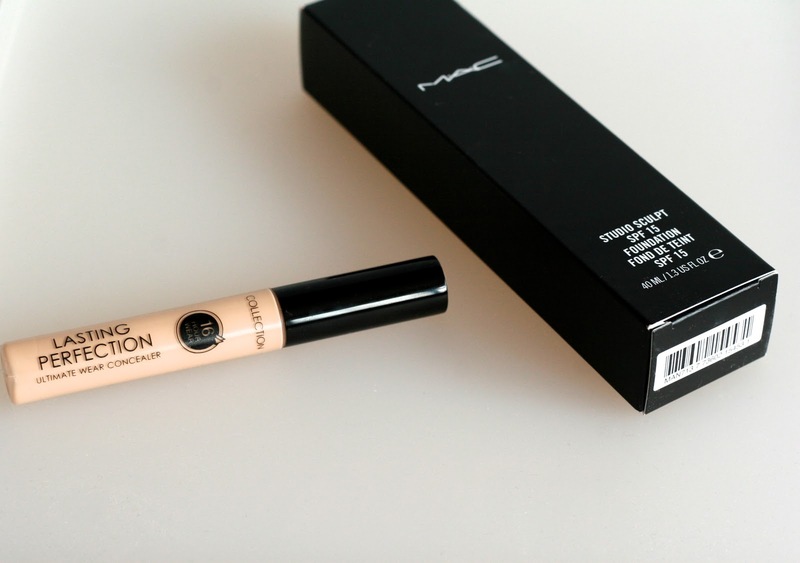 I think it is 100% fair to say that I bloody love this concealer. I am so pleased that it wasn’t one of those things that you hear so many glowing reviews about, then you try it and it just doesn’t live up to your expectations! It really is ‘lasting perfection’. When you put it on, it is pretty thick and I would say it is medium/high coverage but in a good way. Usually when I hear medium to high coverage, I think – “stay clear” but thats only because sadly when I think, high coverage, I also think cakey. Let’s face it, cakey is never a good look! It brings back too many 14 year old Becki memories. I usually put this under my eyes and then also on any blemishes and it covers them instantaneously and it lasts so well. It doesn’t fade at all throughout the day for me personally and I really do just love it. Now, onto the other bad boy that I know a lot of you are gagging to hear. If you read my most recent haul post. Then you will know that I got matched in a M.A.C store for the Studio Sculpt foundation, they told me I was NW20, which I didn’t agree with, I thought it was too pinky/dark for me. If you are wondering, the W in NW20 means warm, and if you are NC20 for example, that means cool. So yeah, I questioned it with her but she did insist that it was correct, so still not being completely satisfied, I went somewhere else and got matched. They told me I was NW15 which I would agree with. It cost me £24 which is pretty pricey but I think it is worth it especially since you get 40ml, with my old Rimmel Wake Me Up foundation, you only get 30ml. Okay, that was a joke, I then take my Stippling Brush from Real Techniques, click here to see the review. I use that to spread all my dots around my face and blend out etc. I don’t do anything special, just standard foundation application. It does take a little bit more work being a gel foundation but it is so worth it, just make sure its blended properly. I’ve heard a lot of people don’t like this foundation, but I think that is because they aren’t using the right brushes/technique. I find that my favourite way to apply it is to use a bigger/more dense brush. I’ll talk about my real technique brushes because I know a lot of fellow bloggers use them. I find that the stippling brush doesn’t work as well as the buffing brush. When I use the stippling brush, I find that it can leave it a bit streaky and takes a lot of extra work. The buffing brush or even a kabuki brush is a lot easier to use! I couldn’t offer any advise about sponges because I don’t use them. I find that they absorb too much of the product so therefore I don’t like them. Also, you have to be very careful to be hygienic and not use them more than once or twice. It is just THE most amazing foundation I have ever tried. I have used a lot of high end foundations which have been okay, but I mean, just okay. Nothing special about them at all and they cost a bomb too. Thats when I started going back to high street foundations because I was getting fed up of paying through the roof for a mediocre foundation just because it was made by someone fancy! It lasts all day and it looks just as flawless at 11pm as it did at 7am. It matches my skin really well which I was a little bit worried about being that they gave me a dodgy matching to start with. There is absolutely no line or colour difference from my face to neck/chest. It makes my skin look pretty damn amazing too. It also has an SPF of 15 which is pretty good! The only, and it really is the only negative point and that would be the smell. The first time I applied it, it seemed to smell a bit chemically but I haven’t noticed it since so I’ve either got used to it or I just made it up. If you are in two minds as to whether to invest in this, I suggest you do it, but make sure that your matching is right. If you aren’t happy with it, say something because at the end of the day, it’s a fair amount of money for a foundation. If you have dry skin, like me. This is perfect for you! If you are someone with more oily skin then I would advise you to think twice about this being that it is gel based. What is your holy grail foundation? Have you tried Studio Sculpt, what did you think? Is there another M.A.C foundation I should check out after?! I might treat myself to some real technique brushes. I think it will be worth it from what I've heard. I've got a make over at Mac next month for a friends wedding so it will be nice to try that foundation out. I really need to hunt down somewhere that sells the Collection concealer to Australian buyers, I've heard such great things about it! Ohhh I think I'm gonna have to try that MAC foundation at some point,I've got dry skin and I find it so hard to buy a foundation that doesn't make it looks worse! My Holy Grail foundation is Estee Lauder Double Wear. I but one bottle of it a year and It lasts as I only like to wear it on special occasions, when I want the best coverage! I know, my nearest one is about 20 miles away 😦 gutted but it is so worth! It is worth making the journey once to find out your colour and then after that I guess you can buy online! I've only just bought lasting perfection for the first time also! I love it, can't believe I've gone so long without it!! Thanks for sharing!! I have been searching for a new concealor!!!! I have gone through 3 already and have not liked any! 😦 But this is next on my list to try!! !